It’s seems an ordinary thing for a kid to play—it’s how we have fun, meet new friends, and start learning what it is to be part of society. So what happens when they can’t? Our charity Touched by Olivia was established by John and Justine Perkins in 2006, just six weeks after they had lost their baby daughter Olivia. At only eight months old, Olivia Perkins had been tragically taken by a rare disease. In the depth of her sickness, her two parents realised a heart-breaking truth: not all children are lucky enough to be granted a basic human right—the right to play. This realisation led them to found their charity. Despite their circumstances, John and Justine had a new goal. They would create a lasting legacy for their young daughter, and make the world where all children can belong despite difference, where all children can play. Touched by Olivia has only grown since. Our not-for-profit organisation works mainly to build inclusive play spaces, or Livvi’s Places. In under 10 years, nearly 20 Livvi’s Places have been established across Australia. These aren’t just your ordinary playgrounds: these are places where children can play side-by-side regardless of ability. They revolve around inclusion, encouragement, and belonging. 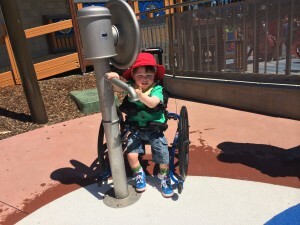 It seems a simple thing to build a playground accessible to all, but the truth is that many playgrounds around Australia just don’t meet the needs of the community. For Touched by Olivia, it’s more than a matter of installing a liberty swing and a couple of ramps to the slippery slide. Building an inclusive space means designing and creating accessible and integrational play equipment—play equipment that fits the all of the community, and not just one part. Our team puts a lot of thought into how we build. Whether it be incorporating accessible pathways and accessible parking and bus drop-off zones, or creating and integrating sensory and tactile play and artworks, graduated challenges, points of recognition and visual clues. No detail is left out! These play spaces are so important. Nearly 1 in 5 Australians are disabled in some way—a staggering statistic. Unexpected too, as so much of our world is tailored to one part of society. This needs to change. Those with different needs to the majority of the population shouldn’t be pushed to the side, especially when this is our children that we’re talking about. All kids need to play, and right now not all can. It’s through the work of charities such as Touched by Olivia that a real difference is being made in our world. We’ve still got a long way to go, but we’re well on our way to fulfilling two inspiring parents’ dream of a happier, healthier world. Limbs 4 Life would like to thank the Touched by Olivia team, and in particular Sarah Coren, for this article. We would also like to congratulate Touched by Olivia on the incredible work the organisation is doing in increasing the number of inclusive play spaces across Australia so that children of all abilities can play.